President Donald Trump’s chief of staff batted down speculation he would be the next member of the administration to go, promising Thursday he was “not quitting today” and would not be getting fired anytime soon, either. “I read it all the time, pretty consistently, but I'm not quitting today, I don’t believe," John Kelly told reporters during a surprise appearance at the White House press briefing. "And I just talked to the president. I don't think I'm being fired today." “I’m not so frustrated in this job that I’m thinking of leaving,” Kelly added. Kelly, a retired general whose service to the U.S. included more than four decades in the Marines and a stint as Trump’s Homeland Security secretary before taking over as the president’s top aide, called his latest position “the hardest job I’ve ever had” and “the most important job I’ve ever had" — though not his "best." That distinction belongs to his time "as an enlisted marine, a sergeant, infantry man." "That was the best job I ever had," Kelly said. A respected military leader, Kelly was named Trump’s chief of staff in July, replacing Reince Priebus, to help restore discipline to a West Wing rife with leaks and dissension. But his 10 weeks on the job have been plagued with images of him looking forlorn amid speculation that he’s frustrated and exhausted. And this week, The Washington Post reported that Trump’s mercurial temperament could prompt Kelly to exit. “There are incredible challenges, economic challenges, health care challenges,” he said, telling reporters that one of his biggest frustrations was “you, all of you." And he denied that he’d been brought in as chief of staff to “control” the president. 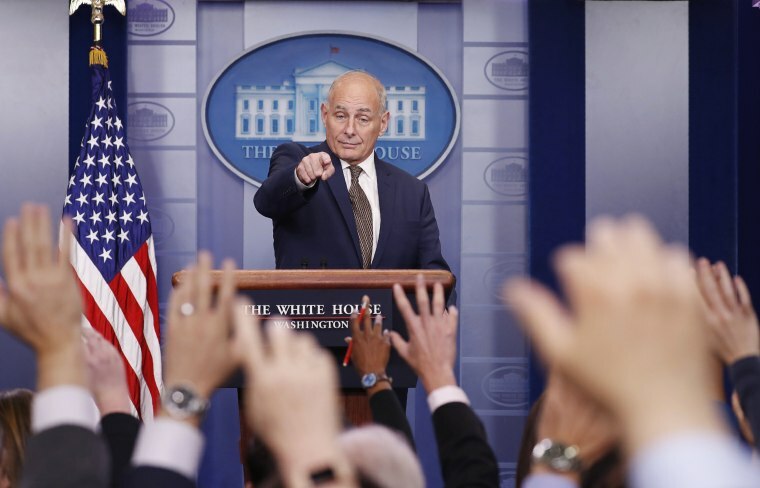 And as far as his penchant for looking solemn or seeming exasperated — Kelly was filmed in August appearing stunned as Trump sparred with reporters about violence in Charlottesville, Virginia, and again last month during the president's speech at the U.N. — the president's top aide said it was just bad timing by the cameras. "You guys always catch me when I'm thinking hard and it looks like I'm frustrated and I'm mad," he said.